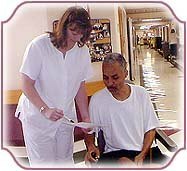 Trinity Neurologic Rehabilitation Center is a skilled nursing facility provider of specialty rehabilitation, complex medical care and extended care services. Trinity of Slidell operates as a 110 bed center of excellence to care for and treat patients with multiple medical rehabilitation and skilled nursing needs. In addition to rehabilitation, an equally important focus for Trinity is providing skilled nursing care services for an adult and geriatric population with emphasis on care for the medically compromised patients, as well as those with less severe medical conditions. Trinity's philosophy of care is to provide patients with the highest quality of cost effective medical care. Through this philosophy of care both patients and families are taken into account when developing and implementing interdisciplinary care and treatment programs. Trinity also works closely with referral source case managers, discharge planners, social workers and other healthcare professionals to enable the smoothest possible transition of patients into the most appropriate settings. All treatment programs are directed toward enabling patients to achieve the highest possible level of functional independence. Trinity believes in positive outcomes and hope for every patient. Trinity is the only skilled nursing facility in Lousiana that is accredited by both, the Commission of Accreditation for Rehabilitation Facilities (CARF) and the Joint Commission. These accreditations display a badge of honor and excellence in the health-care community. Trinity of Slidell's services include: ventilator dependency rehabilitation, general rehabilitation, brain and spinal cord rehabilitation, sub-acute rehabilitation, extended care, and hyperbaric oxygen therapy programs. Trinity also accepts vent-dialysis patients, with the convenience of a dialysis unit on campus.